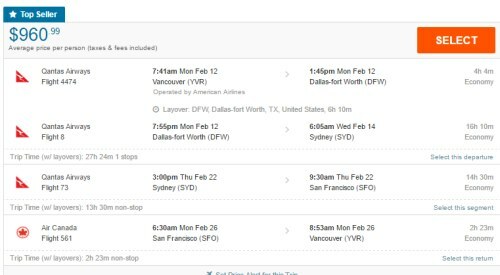 Qantas has dropped the price of some of their flights between June and November from Vancouver to Sydney, Brisbane, and Melbourne, Australia down to between $895 and $961 CAD roundtrip including taxes. An excellent price on a great airline! Some of the June flights are non-stop between Vancouver and Sydney. NOTE: These flights have 1 stop in the U.S. Once or twice In the past year, Vancouver has seen *non-stop* Air Canada flights to Sydney drop to these levels. Currently those flights are $1400+. You can also find quite a few dates in April 2018. The only May dates I've seen are the ones listed above. Listed beside the dates above are the stopover lengths in each direction. Look for the dates that are $961. Click on these flights. And then play around with the middle date, to give you more or less time in Australia vs Los Angeles (or San Francisco). 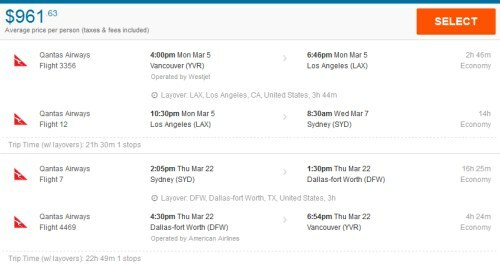 4 Responses to "Vancouver to Sydney, Brisbane, or Melbourne Australia - $895 to $961 CAD roundtrip including taxes on Qantas"
Hey Chris! I don't see the flexible dates option in flight hub on my phone? Yeah, unfortunately FlightHub's mobile site doesn't offer a way to search with flexible dates. Thanks for the fast response Chris! 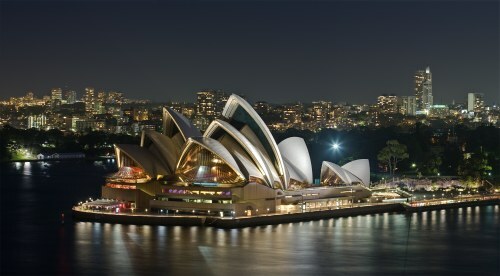 I'm wanting to go to Malaysia and also Sydney from Vancouver.. Thinking of doing it via a stop over to Australia.. What are your thoughts for the best way? Do these Australia flights allow stop overs? These flights do have free stopovers available in Los Angles and San Francisco (not sure if you saw the update to the blog post). A stopover in Malaysia on your way to Australia won't be possible with this deal, since Vancouver, Los Angeles, and San Francisco all have non-stop flights to Sydney - so most airlines will generally be flying through one of these cities to get to Australia. In the rare cases where airlines do give a free stopover, it's generally only in cities that are their main hub, or at the very least, it's a city that's common for them to stop in, on your way to your final destination. From Vancouver to Malaysia, they usually fly through Japan, China, Taiwan, or the Philippines.